Have you ever asked someone a question, then only a few seconds later you have to ask again because you have already forgotten what they said? This was one of my biggest mistakes when I first got married. I would ask my wife something, then immediately forget her answer. Not only was it embarrassing for me, but it agitated my wife by making her feel devalued. Unfortunately for me these were not the only times her words fell on deaf ears. Maybe you can relate to this, have you ever asked a question to someone who just gave you the answer shortly before you asked? I still get caught doing this. Allison will be busy and ask me to make lunch adding that she will have the leftovers. I’ll get up and ask the kids what they want for lunch, then go to Allison and ask her what she wants. Allison just told me what she wanted, but it didn’t process in my brain. 1. We are Not Paying Attention. Often the times I miss what my wife is saying to me. It’s not that I don’t care or am intentionally blocking her out, but sometimes she wants to speak to me when I’m doing something else. Since I am doing something else, I have a hard time breaking from what I was doing. What I was doing may not have been important; I may have just been reading Facebook. All I know is she just said something, and I missed it. How many times has God spoken to us and we just were busy doing something else? 2. We Assume We Know What He Will Say. I have been noticing something very similar later when I have prayed for people. 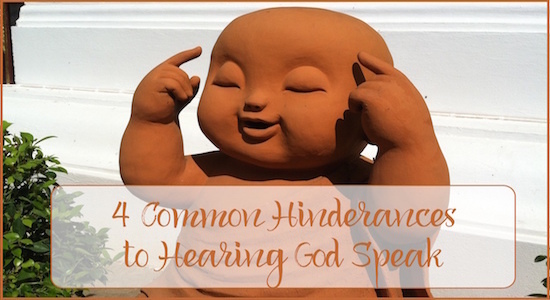 They hinder God’s voice in their lives because they assume they know what He will say. I was praying with one guy who has walked with the Lord for a long time, knows the Bible, and trains leaders. He knows God and the Bible. However, he had a very difficult childhood. His father beat him for many years after he became a Christian, and he was bullied at school. 3. We are Afraid We May Get Into Heresy. This may not be an issue with other relationships, but it needs to be addressed. The main reason we put words into Jesus mouth is we are afraid that we may get lead astray. We are afraid that if we open ourselves up to God speaking that the enemy will fill the void. Let us remember that we have a good Father and He will not fail to give good gifts to His children who ask. When God speaks to us He is not trying to communicate theology, He wants to communicate relationship. Oftentimes my children have God show them their mansion in heaven. They see pools, horses, colors, etc. Will their mansions in heaven really look like this? I don’t know. Will they have a mansion in heaven? Yes. Do my kids enjoy spending time with God? Yes. Are these times they spend with God important to Him? Absolutely. Listening to God speak is not a time to create new doctrine, but to enjoy spending time with God. I am not going to use my kids’ prayer times to convince myself or others whether there are animals in heaven. However, I have found that the heart of these encounters that leaves a lasting impression on us always fall in line with what the Bible also tries to communicate. My friend above needed to hear the voice of God first hand for his heart to be affected. It didn’t contradict what he knew, but he needed to hear it directly from the One who loved him. 4. We Ask Something, But He Wants To Talk About Something Else. There are times when my wife wants to say something to me and I just want to hug her. She doesn’t like it because it feels to her that I am not listening to what she is saying. The problem is that I can’t hear what she is saying because I am thinking I want a quick hug. I think God is like this at times. We want to ask Him something, and He wants to give us a hug. I don’t want to over spiritualize my response to my wife, but we do have to be sensitive to what God wants to do. We may be looking for answers or direction, and He may just want to spend time with us. Let’s change our mindset about God. He wants to speak to us more than we want to listen. Most of our trouble doesn’t come from Him, and often it doesn’t come from some rebellious sin on our part. Most of our trouble with hearing God speak is a lack of focus on what God is doing. Let’s get our eyes off ourselves and what we think should happen, and let’s see God for what He wants. He wants a real, intimate relationship with you… because He thinks you are amazing. Thank you so much for this post. It was really encouraging. So often times, when I would be seeking the answer as to why I couldn’t hear God, and whatever I was reading would talk about unconfessed sin. I always got frustrated, because I could never figure out what sin I was doing, and I would constantly feel rebuked. And even though I never thought of it then, I wonder now: if I had some sin in my heart that needed to be dealt with, wouldn’t God point it out to me? He wouldn’t leave me guessing. but even though, I know that in my mind, my heart tends to revert back to feeling that I must be wrong in some way. And I LOVE how you brought up that God might want to just give me a hug when I come to Him with something. I am one who is needy for hugs and other forms of physical touch, so that meant a lot to me. Speaking about hugs, when we talk on Skype, which I found out I had on my computer the whole time (I just have to figure out what to do now, since I already set up my account), could we talk about this topic further? I have some questions about God hugging me that I would like to ask privately. Thank you for this very uplifting post. Absolutely, we can talk about this. Let me know when would be a good time. If you get these posts by email, you can reply to those emails and I will get it. Or you can use the contact link at the top to send me an email with times and your Skype address.